Wounded at Pietsburg, 8th April 1901. Died 9th April. Killed during the siege of Kimberley. Son of Colonel Charles Salkeld (Royal Artillery). Died of wounds 4th August 1902 at Deerfontein. Memorial at Southwark Cathedral - "To the glory of God and in memory of Lieutenant Colonel Albert Louis Salmon (3rd Derbyshire - Sherwood Foresters) who for the benefit of London Working Boys raised the 1st Cadet Battalion "The Queen's" (Royal West Surrey Regiment) with Head Quarters in this Parish and was its commanding officer for thirteen years (1889-1902) He died 4th August 1902 at Deerfontein South Africa of wounds received whilst Commandant of Stormberg." Died of enteric at Naauwport 16th March 1900. Died of enteric at Modder Spruit 3rd April 1900. Aged 27. Son of Sir Thomas Salt, of Stafford. Born February 1873. Killed in action at Rooival, Transvaal. 11th April 1902. Son of Philip Salter, of Broadclyst, near Exeter. Killed in action at on the Tugela 24th February 1900. Aged 44. Born in December 1855. Memorial at Inniskilling Hill - "Near this spot were killed or mortally wounded on Feb. 23rd-24th 1900, Lieut-Col. T.M.G. Thackeray, commanding, Major F.A. Sanders, 2nd-in-command, Lieut. W.O. Stuart, and 65 NCO and men of the 27th Inniskillings whilst advancing to the relief of Ladysmith." Killed in action near Klip Drift 31st July 1901. Killed in action at Game Tree in the sortie from Mafeking 26th December 1899. Aged 30. Born March 1869 at Sandford, Shropshire. Served in Burma 1892 (medal and bar). After his death, Queen Victoria requested a photograph of him from his family. Killed in action at Spion Kop 24th January 1899. Aged 36. (Ex-6th Inniskilling Dragoons.) Son of Major-General Sauders-Knox-Gore (Royal Artillery), of Ballina, Co. Mayo. Born February 1862. Wounded at Standerton, 22nd April 1902. Died 24th April. Aged 31. Son of Lady Rachel Saunderson, of Co. Cavan and of Glamorganshire. Born June 1870. Died of wounds near Dalmanutha 23rd August 1900. Aged 22. Son of Albert Savory, of Banbury. Served at Tirah 1897 (medal and bar). Died of enteric at Pretoria 29th October 1900. Aged 33. Born at Windsor Castle 14th April 1867. Served Hazara 1891 (medal and bar, MID), Mirzanai 1891 (bar), Ashanti 1895 (star, MID), Nile 1898 (medal, 4th class of the Osmanieh, MID). Wounded at Heilbron, 4th October 1901. Died 22nd October. Aged 21. Son of Francis Schnadhorst, of Birmingham. Killed in action at Colenso 15th December 1899. Aged 26. Son of Percy Schreiber (ex-Royal Scots). Born December 1873. Died of typhitis at Johannesburg 25th September 1901. Aged 25. Son of H.A. Schwabe, of Lymm, Cheshire. SCOBELL - Lieutenant John Francis - 1st Leicester Regt. Died of enteric at Vrede 6th March 1901. Aged 23. Son of Rev. John F. Scobell. Born June 1877. SCOTT - Captain Henry Farquhar - 3rd Royal Berkshire Regt. Killed in action near Hout Kop 14th June 1901. Died trying to reach British forces with his small volunteer force. Died of illness at Capetown 15th May 1900. Aged 32. Born July 1867. Served in Burma 1885-89 (medal and 2 bars), Zhob Valley 1890, Waziristan 1894 (bar). Buried at Woodstock Cemetery, Cape Twon - "Capt. Seagrim R.A. 15.06.00." Died of enteric at Wynberg 5th March 1902. Died of dysentry at Kroonstad 1st June 1901. Aged 30. Son of W. Seeds, of Ballymott House, near Downpatrick. Born October 1870. 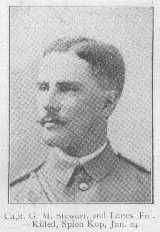 SELOUS - Lieutenant Harry Dyson - 2nd Bedfordshire Regt. Killed in action at Paardeberg 18th February 1900. Aged 26. Born July 1873. Killed in action at Graspan 25th November 1899. Aged 23. Born December 1875. Served on HMS Monarch. SEYMOUR - Major L. J. - Cape Pioneer Railway Regt. Killed in action at Zand River 14th July 1900. (born in Australia). Killed in action on the Upper Tugela 5th February 1900. Aged 21. Born June 1878. Wounded at Tafelkop, 20th December 1901. Died 22nd December. Aged 23. Born March 1878. SHARPE - 2nd Lieutenant James Minot - 4th North Staffordshire Regt. Wounded near Carnarvon, Cape Colony, 21st February 1902. Died 23rd February. Aged 20. Son of James Sharpe, of London. Died of enteric at Bloemfontein 28th May 1900. Accidentally drowned on voyage home from South Africa, on the SS Canada. 28th July 1901. Aged 29. Son of Sir Michael Robert Shaw-Stewart, of Ardgowan, Greenock and Lady Octavia Grosvenor. Born October 1871. DSO in 1901. Killed in action at Schotland West 20th April 1902. Aged 21. Born December 1880 at Bradfield. Died of enteric at Springfontein 22nd July 1901. Killed in action near Brakenlaagte 31st October 1901. Aged 26. Son of Colonel C.H. Shepherd, D.S.O. Born May 1875. Had served in the British South Africa Police 1898-99. QSA and 7 bars. Killed in action at Modderfontein 17th September 1901. Aged 27. Born May 1874. Died of illness at Bloemfontein 6th November 1900. Aged 52. Born March 1848. Killed in action at Talana Hill 20th October 1899. Aged 42. Son of Captain Sherston (6th Dragoon Guards), of Bath. Born July 1857. Served Afghanistan 1878-80 (medal and 3 bars, Star, MID), Burma 1886-7 (medal and bar, MID, DSO). Killed in action near Thaba N'chu 30th April 1900. Ex-Surma Valley Light Horse Volunteers and Bengal Constabulary. Son of Major-General St. George Daniel Showers, of Fort William, Calcutta, and Cheltenham. Memorial at Cheltenham, Gloucestershire - "This memorial is erected in memory of those Cheltenham men, who, either as regulars, or volunteers, died in their country's service, during the South African war, and on the side panels hereof are recorded the names of those Cheltenham men who volunteered, and served in the war..... Maj. E. Showers (L.H.)..... Unveiled by Lt. Gen. Sir Ian Hamilton, K.C.B. 17th. July 1907. W. Nash Skillicorne, Mayor." Died of enteric at East London 10th January 1901. Aged 36. Born June 1864. Served 15 years before being commissioned in 1899. Killed in action at Pieter's Hill 27th February 1900. Aged 20. Educated at Cheltenham College. Born November 1879. Died of dysentry at Schhoeman's Kloof 30th April 1901. Aged 23. Son of Dr. W.S. Simpson. Born May 1877. SIORDET - Lieutenant Frederick John - West Riding Regt. Killed in action at Paardeberg 18th February 1900. Aged 28. Born December 1871. Killed in action on the Upper Tugela 23rd February 1900. Aged 41. Son of Captain G.T. Sitwell (3rd Dragoons). Born October 1858. Served Afghanistan 1879-80 (medal), Egypt 1882 (medal and Khedives star), Nandi (East Africa) 1895 (MID), Uganda 1897 (MID, DSO). Husband of Amy Cooke. Killed in action at Nooitgedacht 13th December 1900. Aged 25. Born December 1875 in Victoria, Australia. Son of T. Skene, a member of the Commonwealth Parliament of Australia. Wounded at Rhenosterfontein, 5th September 1901. Died 8th September. Died of enteric at Kroonstad 29th January 1901. Aged 29. Son of E. Slater, of Slingsby Hall, Yorkshire. Born December 1872. DSO 1901. Died at Intombispruit, Ladysmith 13th January 1900. Buried at Intombi memorial cemetery, along with his stepson Trooper Alexander Anderson (who also died at Intombi). There is a Memorial to the Border Mounted Rifles at Umzinto, where William lived from 1881 and from which area the members of the Border Mounted Rifles were drawn. Killed in action at Tiger's Kloof 23rd November 1900. Aged 28. Born October 1872. Died of dysentry at Kroonstad 21st April 1901. Killed in action at Water Kloof, near Craddock. 20th June 1901. Killed in action near Douglas 30th May 1900. Ex-Middlesex Regt. Son of Captain S. Spence (28th Foot). Served in the 77th Foot 1863-75. Retired to New Zealand and then moved to Cape Town. Served Bechuanaland 1897. Died at Krugersdorp 26th September 1900. Died of enteric at Germiston 8th May 1901. Aged 22. Son of Richard Spicer. Born June 1878. Wounded at Waterval, 2nd June 1902. Died at Mortimer on the 3rd June. Aged 35. The Peace Treaty ending the War was signed two days before he was wounded, the Boers being unaware of the fact. Son of Richard Spratt, of Pencil Hall, Mallow. SPRECKLEY - Lieutenant-Colonel J. A. , C.M.G. - Rhodesian Protectorate Regt. Killed in action at Klip Drift 20th August 1900. Aged 35. Born March 1865. CMG 1896 for South Africa. Killed in action at Wepener 9th April 1900. Served in the Galeka and Gaika campaigns 1877-78, and Basutoland 1880. Killed in action at Vlakfontein 29th May 1901. Son of Rev. H.C. Spring, of Tiverton, Devon (ex-army chaplain). Reported to have been killed while lying wounded. Memorial at St. Andrews Church, Alwington, Devon - "To the glory of God and in loving memory of Henry Geoffrey Spring, Lieut. 27th (Devon) Imperial Yeomanry who was killed in action at Vlakfontein S. Africa on the 29th May 1901 aged 20. Also of Harold Paynter Spring 2nd Lieut. 28th Punjaubis who died of enteric fever at Delhi, India. Sons of the Rev. Henry Coleridge Spring, Rector of this parish by whom this tablet is erected." Died of fever at Ladysmith 15th January 1900. 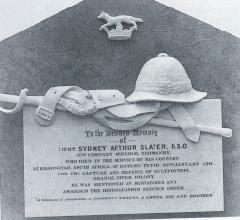 Memorial in St. Anne's Church, Portsmouth - "This tablet is erected by Capt the hon Hedworth Lambton CB and the Officers and Men of HMS Powerful in memory of Commander Alfd P. Ethelston RN Fleet Paymaster, Wm H.F. Kay RN, Commander Fredk G. Egerton RN, Lieutenant Edward Stabb RNR, the Non-Commissioned Officers, Petty Officers and Men of the Naval Brigades of HMS Powerful who were killed or died during the campaign in South Africa 1899-1900." Died of wounds near Dewetsdorp 28th April 1900. Aged 36. Son of Sidney Stanley, of Longstone Hall, Cambridgeshire. Born July 1863. Killed in action at Hekpoort 16th September 1900. Died of peritonitis at Utrecht 9th March 1901. A fellow of the Royal Colonial Institute. Wounded at Nooitgedacht, 13th December 1900. Died at Pretoria, 30th December. Aged 22. Son of Captain F.R. Stanton (Royal Scots). Born December 1878. Killed in action at Ronderan 30th January 1902. Aged 26. Son of F.A. Stapleton-Bretherton, of Rainhill, Lancashire. Born August 1875. Served as Assistant-Inspector of the Gold Coast Constabulary 1899-1900. Monument at ICL Beaumont - "Capt. F. Owen-Lewis Nov 24 1899 near Graspan. Lieut. A. Byrne June 10 1900 Bloemfontein. Lieut. J. Lawlor Augt 30 1900 Waterwal. Lieut. A.E. Murphy May 29 1901 Middlekraal. 2nd Lieut. R. Stapelton-Bretherton Jany 30 1902 Ronderan. RIP This monument in memory of old Beaumont boys who fell in the South African War 1899-1902 was erceted by by some old boys and friends of Beaumont 1903." Died of enteric at Ladysmith 29th January 1900. Aged 27. Son of Colonel Richard Stapleton-Cotton, of Somerford Hall, Staffordshire. Born August 1872. Died of enteric at Bloemfontein 26th May 1900. Aged 19. Son of Robert Stapylton-Bree, of Hamilton, Australia. STAYNER - Captain Frederick Sutherland - 1st Gloucestershire Regt. Died of enteric at Ceylon 8th October 1900. Aged 34. Severely wounded at Nicholson's Nek. Born March 1866. Killed in action on the Tugela 24th February 1900. Aged 23. Son of Lieutenant-Colonel Frederic A. Stebbing (King's Regt. ), of Ealing. Born June 1876. QSA and 2 bars. Died of enteric at Bloemfontein 13th February 1902. Killed at Kaap River, near Vlakfontein 9th October 1900. Aged 36. Born February 1864. Served Burma 1886-88 (medal and 2 bars). Killed in action at Spion Kop 24th January 1900. Aged 26. Born February 1873. Served Sudan 1898 (medal, Khedive's medal and bar). Died of enteric at Pietermaritzburg 10th December 1900. Aged 45. Served 14 years before being Commissioned in 1889. Served Egypt 1882 (medal and Khedive's star). Killed in action at Modder River 28th November 1899. Aged 44. Born October 1855. Killed in action at Schweitzerrenneke. 29th December 1900. STRONG - Lieutenant Charles Powlett, D.S.O. - 2nd Bedfordshire Regt. Killed in action at Graspan 6th June 1901. Aged 25. Son of Lieutenant-Colonel Strong, of Peterborough. Born January 1875. Memorial in Northampton Cathedral - "To the Glory of God and in memory of Brave Men, inhabitants of this County and neighbourhood, who gave their lives for their Sovereign and Country during the War in South Africa 1899-1902, the Western Window of this Cathedral was filled with stained glass, AD 1903.... The Bedfordshire Regiment, Lieut. C.P. Strong, DSO..."
Died of wounds at Spion Kop 24th January 1900. Aged 41. Born February 1858. Served South Africa 1877-8, Zululand 1879 (medal and bar, MID). Died of epilepsy at Mossel Bay 12th December 1901. Died of dysentry at Winburg 18th April 1902. Aged 41. Born November 1860. Killed in action on the Upper Tugela 23rd February 1900. Aged 22. Educated at Cheltenham College. Son of Major Burleigh Stuart, of Omagh, Co. Tyrone. Born November 1877. STUBBS - Brevet-Major Arthur Kennedy - 2nd Worcestershire Regt. Killed in action at Rensburg 12th February 1900. Aged 32. Son of Major-General F.W. Stubbs (Royal Artillery). Born December 1867 at Meerut, India. Served Niger 1898 (wounded, MID, medal and bar). Memorial at Worcester Hill, Yardley Farm, South Africa - "In Memory of the following Officers, N.C.O's and Men of the 2nd Batt. (36th) Worcestershire Regiment who were killed in action or died of wounds, received in action near this spot while doing their duty defending this position on 12th February 1900..... Major Stubbs ... "
Killed in action near Frederickstad 29th May 1902. Aged 19. Son of Sir Thomas Sutherland (Chairman of the Peninsular & Oriental Steamship Company, and MP for Greenock). Born September 1882. Died at sea returning from South Africa to Canada. Aged 35. Son of Rev. Walter Henry Sutton, of South Cerney, Gloucestershire. Killed in action near Ermelo 16th October 1900. Aged 25. Son of J.C. Swanston, of Bourne End, Buckinghamshire. Born February 1875. Killed while trying to bring in wounded troopers. Killed in action at Pieter's Hill, on the Upper Tugela. 27th February 1900. Aged 36. Born June 1863 at Manor Adel, near Leeds. SYMONS - Major-General Sir William Penn, K.C.B. Wounded in the battle of Talana, 20th October 1899. Died 23rd October at Dundee. Aged 56. Son of William Symons, of Hatt, Cornwall. Born 17th July 1843. Served in Zululand with the 24th Foot (medal and bar), Burma 1886 (medal and bar, MID), Chin-Lushai 1889 (bar, C.B. ), Waziristan 1894 (bar), Tochi and Tirah 1897 (medal and 2 bars, K.C.B.) Husband of Caroline Hawkins. A monument in St. Paul's Church, Ambala, India - "To the memory of Major General Sir William Penn Symons K.C.B. who was mortally wounded when leading on his troops to victory against the Boers at the battle of Talana Hill on the 20th Oct. 1899. Erected by Officers who had served under him."